Welcome Relocating Norfolk Southern Employees! If you didn't hear, one of the nation's premier transportation companies announced on January 27th the closing their Roanoke facility and relocate 500 jobs to Norfolk or Atlanta. Expressions of pain, anger and worry poured out from Richmond and Washington, District of Columbia. Read more here. My heart goes out to the families affected. Having worked in Corporate America for many years prior to becoming a Realtor, I know how it feels to receive life changing news. While I cannot change what is transpiring, I can offer my assistance and expertise to anyone relocating to the Atlanta area. My passion is working with families/individuals relocating or in transition (up-sizing or downsizing) and I'd be happy to speak with you. Call or email me and let me know how I can assist you. View my Client Testimonials & Pictures. 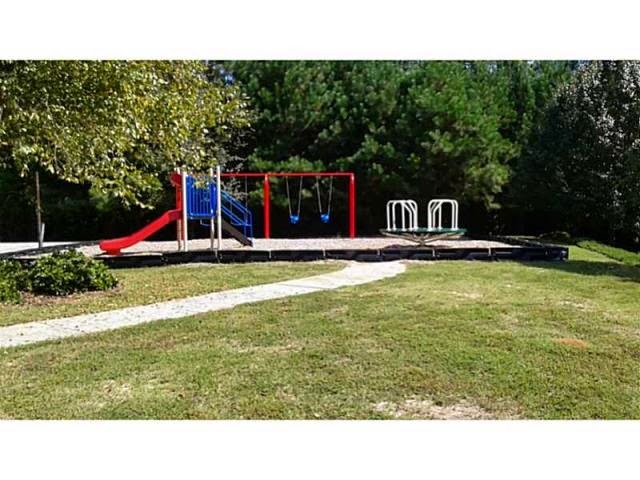 For Sale in Loganville, GA - Large Lot & Great Floor plan! 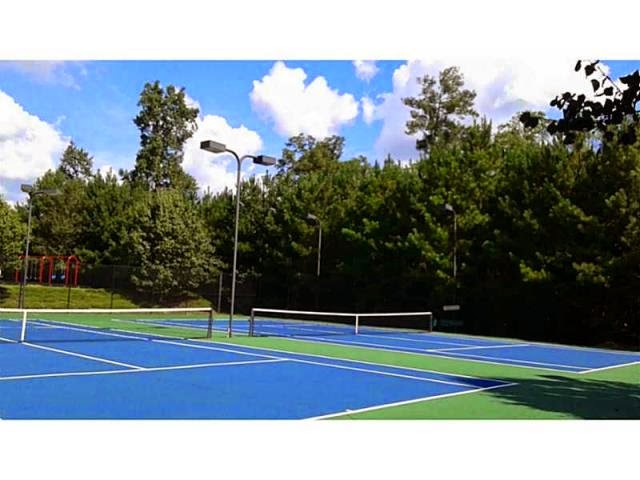 Conveniently located in the heart of Loganville! This WELL MAINTAINED and MOVE-IN READY home sits on a SPACIOUS and PRIVATELY FENCED CORNER LOT. PATIO AREA& LONG DRIVEWAY make entertaining easy! NEW GARAGE DOOR OPENER. FRESH PAINT. HARDWOOD FLOORS. UPGRADED CARPET, KITCHEN SINK, & DISPOSAL. FAMILY ROOM w/ GAS LOG FIREPLACE. FORMAL LIVING ROOM. SEPARATE DINING ROOM. CABINET in LAUNDRY ROOM. CUSTOM HOT TUB DECK. 1 year Home Warranty is available. Just listed and interest is already high. 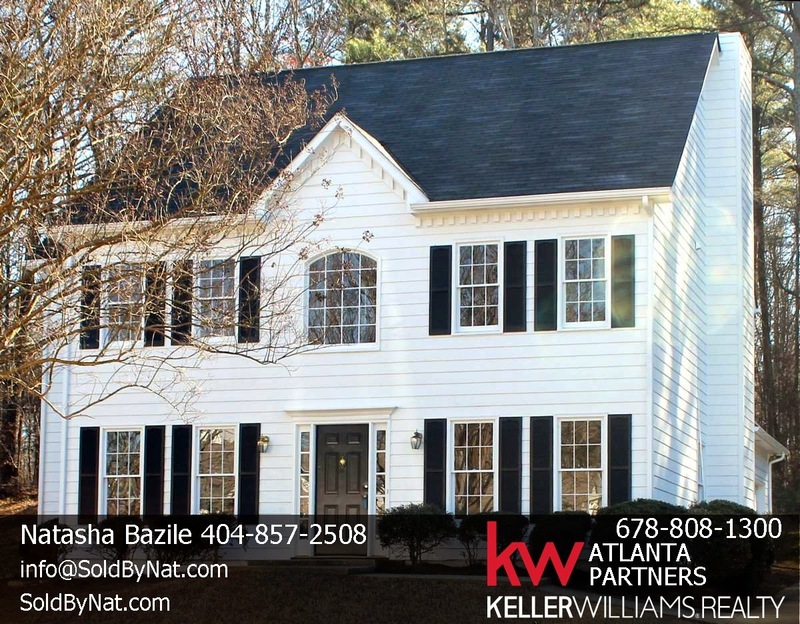 Call me to today at (404) 857-2508 to schedule your private showing! A simple decision to rent your current home instead of selling it when moving to a new home could have far reaching consequences. If you have a considerable gain, in a principal residence and you rent it for more than three years, it can lose the principal residence status and the profit must be recognized. Section 121 provides the exclusion of capital gain on a principal residence if you own and use it as such for two out of the last five years. This would allow a temporary rental for up to three years before the exclusion is lost. Let’s assume there is a $100,000 gain in your principal residence. If it qualifies for the exclusion, no tax would be owed. If the property had been converted to a rental so that it didn’t qualify any longer, the gain would be taxed at the current 20% long-term capital gains rate and it may incur a 3.8% surcharge for higher tax brackets. At least $20,000 in taxes could be avoided by selling it with the principal residence exclusion. Depreciation, a tax benefit of income property, is determined by the improvement value at the time of purchase or at the conversion to a rental whichever is less. If the seller sold the home and took the exclusion and then, bought an identical home for the same price, he would be able to have 60% more cost recovery and avoid long term capital gains tax. It is always recommended that homeowners considering such a conversion get advice from their tax professional as to how this will specifically affect their individual situation. Thinking about RENTING your home or buying an investment property? Let's see if this is the best option for your! 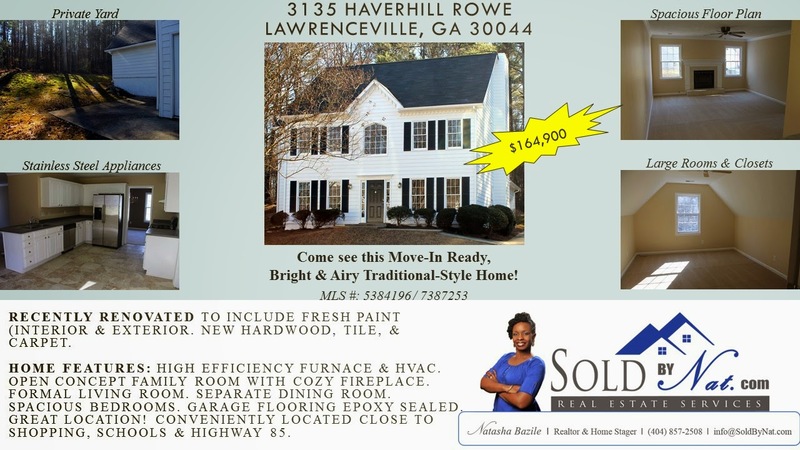 Call me at 404-857-2508 or email me. A well-planned garage or yard sale can make room in your home, get rid of unused items and make some money but it needs some planning to be successful. Saturdays are generally the best day but there may be some exceptions. Experienced garage-salers believe that a well-planned one-day event will do as well as a multi-day event. Serious purchasers will look for the “new” sale and most people don’t come back multiple days. Advertise in local newspapers and free online classified sites like craigslist. If several families are going together for the sale, mention that in the ad; it will be a big draw. Mention your bigger-ticket items like furniture, equipment and baby items. Garage sale signs can be purchased or made at Staples, Fedex Office or Kwik Signs. Signs need large lettering so they’re easy to read while people are driving. Most important info: Garage or Yard Sale, address, date and time. Directional signs are also important. Balloons and streamers to attract attention to the signs are very helpful. Consider using the service Square so that you can take credit cards. The cost is 2.75% per swipe and can be done on your smartphone or iPad. You’ll need to sign up at least two weeks in advance to receive your reader. Unless you’re having an estate sale, keep your home locked. You don’t want people wandering through your home while you’re outside. If you start to accumulate a lot of money, take some of it inside. Don’t discuss how much money you’ve made during the sale or how successful it has been. People will want to bargain; it’s the nature of the game. Consider this strategy: less negotiations early in the sale and possibly, more toward the end of the sale. Is your garage sale in preparation for a move? I'd love to be your agent or put you in contact with a great agent in your area! RECENTLY RENOVATED to include FRESH PAINT (interior & exterior). NEW: HARDWOOD, TILE, CARPET, ROOF, HIGH EFFICIENCY FURNACE, & HVAC. Home features: STAINLESS STEEL APPLIANCES. OPEN CONCEPT FAMILY ROOM with COZY FIREPLACE. FORMAL LIVING ROOM. SEPARATE DINING ROOM. SPACIOUS BEDROOMS. PRIVATE BACKYARD. GARAGE FLOORING EPOXY SEALED. GREAT LOCATION! 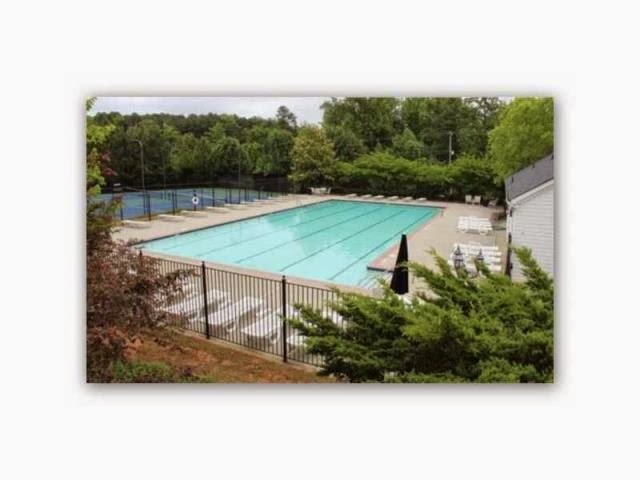 Conveniently located close to SHOPPING, SCHOOLS, & HIGHWAY 85. Hurry, this home offers it all! With roughly 12.5% of the population over 65 years of age and the increase in kids attending college, it is understandable that people have the need to downsize because they may not need the amount of space they did in the past. There is something to be said for the freedom acquired by divesting yourself of “things” that have been accumulated over the years but are no longer needed. I specialize in working with individuals and families in all transitions of life. From first-time homebuyers to downsizing. I'd love to see how I can assist you! 0% financing has induced car buyers into taking the plunge because it doesn’t cost anything to use someone else’s money. While mortgage rates are not at zero, they’re close enough that many buyers are applying similar logic. Qualified mortgage interest is deductible on taxpayers' returns subject to the maximum acquisition debt of one million dollars. For the fortunate homeowners who have paid off their mortgage, their acquisition debt was reduced to zero and only the interest on a maximum home equity debt of $100,000 is deductible. If you have to pay interest, deductible interest is preferable because it reduces your actual cost. Consider the following example of a taxpayer with a $500,000 debt-free home. If they did an 80% cash-out refinance of $400,000, $100,000 would be considered home equity debt and the interest on that would be deductible on their income tax. The other $300,000 of debt is considered personal debt and the interest is not deductible. However, because the rates are currently so low, the loss of deductibility of the interest doesn’t have as much impact as if the rates were higher. The key is to have a good purpose for the money that would offset the actual cost of the interest. Paying off a higher rate debt such as credit cards, student loans, possibly, business debt could all have significantly higher interest rates. Refinancing a home and eliminating debts like these could be a big savings. All lenders are not the same. Call for a recommendation of a trusted mortgage professional.